Li, L., Manning, W.J. and Wang, X.K. 2018. Autumnal leaf abscission of sugar maple is not delayed by atmospheric CO2 enrichment. Photosynthetica 56: 1134-1139. In the words of Li et al. (2018), "although stimulatory effects of CO2 on leaf photosynthesis of trees has been widely reported and are fairly well understood (Ellsworth et al., 2012; Battipaglia et al., 2013; Keenan et al., 2013), less is known about the effects on leaf net photosynthesis during the [end of] the growing season." And so it was the authors' objective to investigate the effect of elevated atmospheric CO2 on the timing of autumnal leaf falling and late-season photosynthesis. To accomplish their work, the three scientists exposed 3-year-old sugar maple (Acer saccharum) trees to three concentrations of CO2 (400, 600 and 800 ppm, abbreviated AA, A6 and A8, respectively) under well-watered and fertilized conditions in a climate-controlled glass greenhouse environment at the University of Massachusetts, Amberst, MA. And there, over the course of a growing season they monitored a number of growth-related parameters that were key to their investigation. The results of the experiment were summed up by the authors as follows: (1) "PNmax was continuously stimulated to the greatest extent in A8 at 319% and 160% in A6 until the end of the growing season, respectively," (2) "leaf number, leaf area, and accumulative height growth all significantly increased by elevated CO2, which led to a 323% increase in A8 biomass and 235% in A6 biomass after 156-d fumigation" (see Figure 1), and (3) "no significant differences were found in the timing of leaf abscission in the three CO2-concentration treatments." Thus, although elevated CO2 stimulated net photosynthesis and increased leaf number and leaf area, which factors acted to enhance carbon uptake and storage in sugar maple through the end of the growing season, it had no influence on the timing of leaf autumnal senescence. This latter point was significant, in that it has been postulated that elevated CO2 might induce early senescence and limit carbon gains at the end of the growing season. Given the above observations, Li et al. conclude that "future elevated CO2 is not going to affect autumnal phenology of A. saccharum Marsh through altering the length of the growing season directly, although the productivity increase [over the growing season] should be considered carefully in a prediction of forest sink capacity." Figure 1. 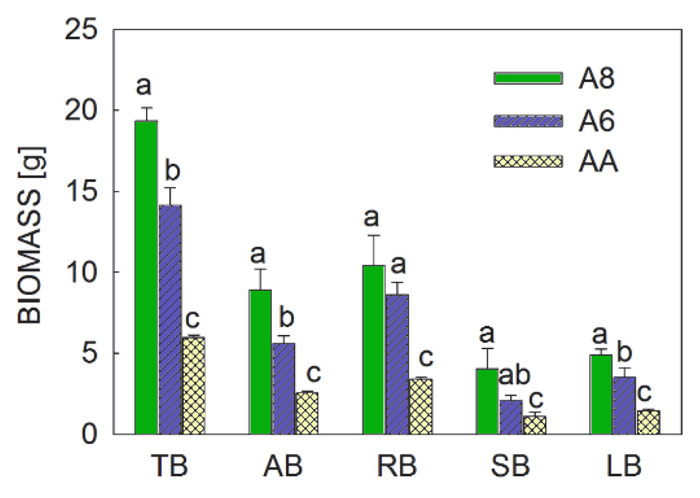 Total biomass (TB), aboveground biomass (AB), root biomass (RB), stem biomass (SB) and leaf biomass (LB) of sugar maple (A. saccharum) in 800 (A8), 600 (A6), and 400 (AA) ppm CO2 air. Values were means ± SD. Different letters indicated multiple comparison results between three treatments. Differences were considered significant when P < 0.05. Source: Li et al. (2018). Battipaglia, G., Saurer, M., Cherubini, P., Calfapietra, C., McCarthy, H.R., Norby, R.J. and Cotrufo, M.F. 2013. Elevated CO2 increases tree-level intrinsic water use efficiency: insights from carbon and oxygen isotope analyses in tree rings across three forest FACE sites. New Phytologist 197: 544-554. Ellsworth, D.S., Thomas, R., Crous, K.Y., Palmroth, S., Ward, E., Maier, C., DeLucia, E. and Oren, R. 2012. Elevated CO2 affects photosynthetic responses in canopy pine and subcanopy deciduous trees over 10 years: a synthesis from Duke FACE. Global Change Biology 18: 223-242. Keenan, T.F., Hollinger, D.Y., Bohrer, G., Dragoni, D., Munger, J.W., Schmid, H.P. and Richardson, A.D. 2013. Increase in forest water-use efficiency as atmospheric carbon dioxide concentrations rise. Nature 499: 324-327.